By now you've probably seen the reviews of the other Galaxy S phones -- the Epic 4G, Captivate, or Vibrant -- or at least gotten an idea of what Samsung's push into the Android market is all about in 2010. After hitting every other major US carrier with like-minded devices, the company has finally seen fit to unleash the Fascinate on Verizon. Up until this point, the Android offerings on Big Red's network have been varied, but not all particularly attractive beyond the Droid lineup. The Fascinate is arguably the first handset that gives something like the Droid X or the Incredible a proper run for its money. Of course, those are pretty high stakes in game that changes on an almost daily basis, and Samsung's options are not without their... idiosyncrasies. That truth is nowhere more pronounced than on its latest handset. So is the company poised to hit the market where it hurts with this final puzzle piece, or is this an incomplete picture? Read on to find out in our full review of the Samsung Fascinate! How would you rate the Fascinate? Like its brethren the Captivate and Vibrant, the Fascinate is a candybar device which relies mainly on its touchscreen and four dedicated Android navigation buttons to get things done. The design of the phone is basic enough; a simple slab with rounded edges, a slight silver band that runs around the sides of the device, and little detail save for a gray and black patterned back. The phone is manufactured out of plastic, and feels like and somewhat hollow to the touch. It's not cheaply made, but it doesn't have the heft of some other devices in this class (such as the Droid 2). Even the Captivate has a metal back, which gives it a slightly higher-end feel. On the back of the device is a five megapixel camera and LED flash, and there are hard buttons for the power / sleep and volume control on either side of the phone. The design of the phone is simple enough to be inoffensive, but not daring or notable in any real way. In our hands, 4-inches feels like the perfect size for this type of phone; the device feels considerably smaller than something like the Evo, but is more comfortable to type on than the Incredible or iPhone. The general size and thickness will keep it competitive (the phone is nearly as thin as the iPhone 4), though in a sea of like-minded devices, the Fascinate could easily be overlooked. In terms of raw specs, the Fascinate looks lustworthy no matter how you slice it. Like the other Galaxy S phones, the device houses a 1GHz Hummingbird CPU, 4-inch 800 x 480 Super AMOLED display (capacitive touch of course), 512MB of RAM, a microSD slot expandable to 32GB (it comes with a 16GB card), along with proximity and light sensors, and an accelerometer. Additionally, the device packs in WiFi (802.11b/g/n), Bluetooth 2.1, and an AGPS radio. Of course there's a 3.5mm headphone jack and Micro USB port, but other than that, the phone is fairly no-frills. You won't find a hidden HDMI jack somewhere on this device. As we've noted on the other Galaxy S devices, that Super AMOLED display does look pretty stunning. It seems to produce truer, richer colors than standard AMOLED screens we've seen, and its sunlight performance wasn't completely useless (though it was notably harder to see than the iPhone 4's IPS display when held side-by-side). 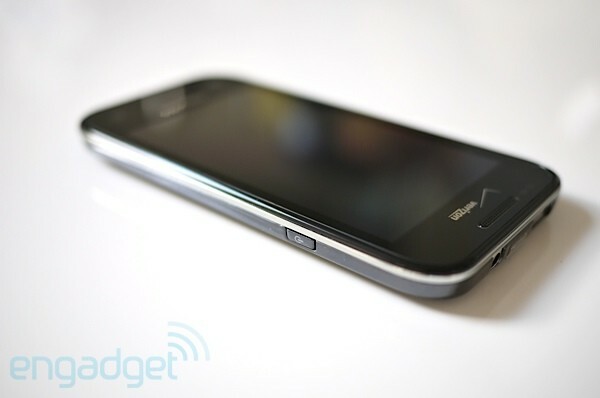 It's a healthy package, but absolutely contemporary with the Nexus Ones, Droid Xs, and iPhone 4s of the world. Nothing here is really groundbreaking (and obviously we've seen pretty much the same phone in three other slightly tweaked designs), but it's keeping up with the Joneses just fine when it comes to specifications. The camera on the Fascinate seemed just about identical to its brethren the Captivate and Vibrant, save for the fact that it's actually got a flash. 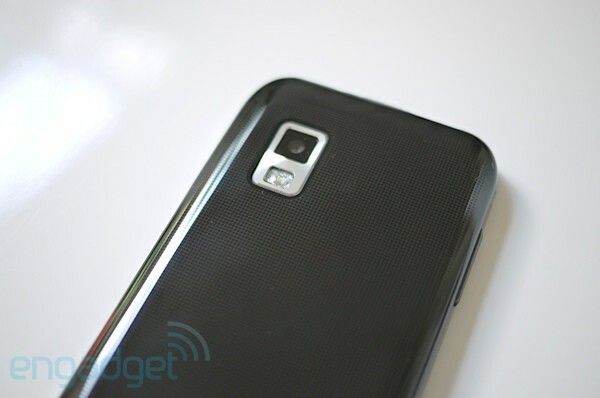 We're not sure why Samsung chose to leave the GSM models flashless, but we're happy to see the LED here. In terms of photo quality, we thought that the Fascinate performed admirably in most settings, though like our previous experiences with the other Galaxy S phones, photos the devices produce have a certain quality of, well... phone pictures. Still, the whole line is capable of pretty handsome shots in the right setting, and on the Fascinate, night shots and low light settings were obviously easier to work with now that we have some artificial help. On the video front, we were particularly impressed with the 720p video quality of the device. Even indoors, the camera produced smooth, stable images that looked good when we blew them up on our TV. We don't think anyone should consider the fascinate for the next Citizen Kane, but for family outings (or just general partying with friends), the phone stands in nicely for a dedicated video camera. Phone quality on the Fascinate was really very good, and speakerphone volumes and tone were loud and clear without becoming distorted or piercing (tones lots of modern phones seem to prefer). Our callers voiced no concern with the outgoing sounds of the phone, and our incoming calls sounded pretty crisp to our ears. Since this is a Verizon handset, call stability was excellent -- in fact, while testing we didn't have a single dropped call. We do have some reservations about the phone software, however (more on software in a moment). More than once we had a call just stall out when we tried to hang up, leaving the phone frozen and us pounding buttons and feeling pretty frustrated. There seemed to be some disconnect (ha ha) between when you tell the phone to hang up and when the phone actually hangs up. It could have been the area that we're in, a symptom of a larger software issue, or just a fluke, but it was extremely annoying when it occurred. As with most devices these days, battery life is subject to the wants of many aspects of that particular device's OS. In the case of Android, the changes or additions made by a manufacturer or carrier can have significant repercussions on the device's battery life. That's certainly the case for the Fascinate, where the kind of battery life you'll wind up with depends largely on how hard you want to push your auto-updating widgets and backgrounding IRC apps (for us, that's a lot). In typical use, the 1500mAh battery kept things chugging along for a full day of work and then some. Hammering on the device harder (and making lots of calls) can definitely put you into the red far faster than you'd like, however. The combo of lots of data and lots of voice on any modern smartphone is going to be a drain, but the Fascinate didn't seem especially susceptible to the damage, which is a very good thing. 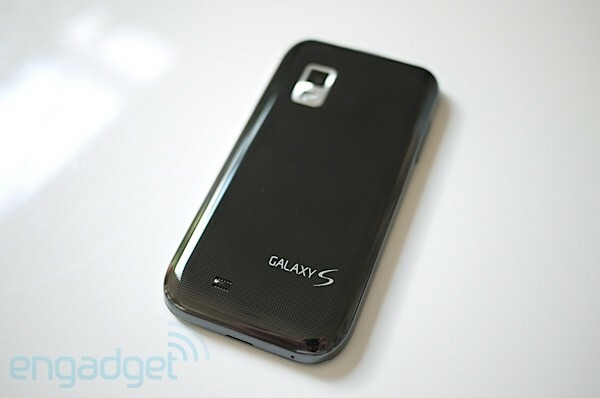 As you should know by now, the Galaxy S phones are all running Android 2.1 with a super-special TouchWiz skin. If you want a deep dive on the modern TouchWiz and what it means for your Android experience, you should take a look at our Epic 4G and Captivate / Vibrant reviews for extra background. That said, there are a number of decisions made with the Fascinate's particular brand of the TouchWiz / Android mashup that bear mentioning. First -- we had a fairly extreme shock when we booted up this device for the first time. After some experiences with the "new" Android (that is, devices which have a much heavier carrier influence than Android's first wave), we've come to expect just about anything. However, what we found with the Fascinate still seems notable. The phone does not use Google as its default search. And it doesn't utilize Yahoo! either. No, the Fascinate search engine defaults to Bing. 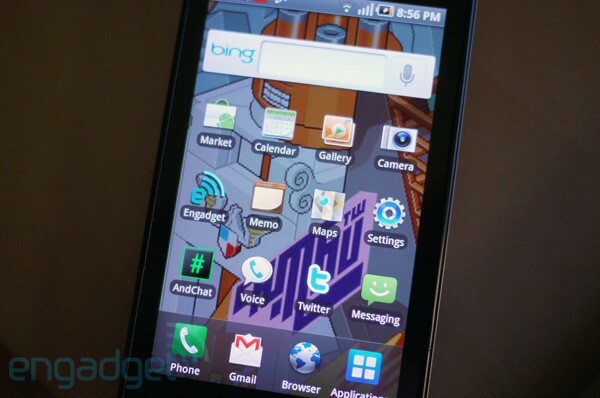 Bing is used for the homescreen widget. It is defaulted to in the browser. It is present across the device... and there's no way to choose a different search engine. Like, you know -- Google. When we pressed Verizon reps about this, they let us know in no uncertain terms that the stock engine is Bing without a second choice. This was maddening to us. We don't have a personal issue with Bing, but it's not our engine of choice, and we'd be willing to bet that it's not yours either. Now, imagine buying an Android phone -- a Google phone -- only to discover that not only was Google not defaulted to as a search engine, it's not even an option! For us, this is actually a deal breaker. 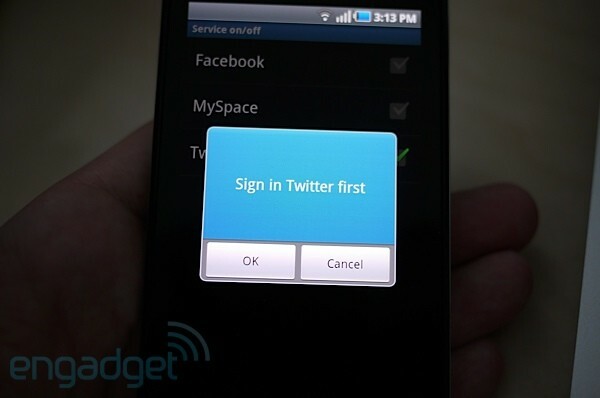 It's fine to throw a new choice a user's way, but to force them into using nothing but that choice seems pretty low. Even on the original iPhone you were given a choice between Google and Yahoo!. Here, you've got Bing unless you want to get hacking -- and most people actually don't want to get hacking. They just want to use their phones. Again, it's not that Bing is a bad search engine, but Google is the standard. If it's not even offered, what does that say? Beyond this, Verizon also has tweaked the device so that it defaults to Verizon Navigator instead of Google Navigation in any area of the phone which calls for navigation (including the context menu in contacts). This can actually be changed, but only through a fairly arcane combination of settings -- another annoying alteration that seems unnecessary here. As with the Dell Aero and other unfortunate devices which carriers have attempted to warp to a more profitable variation of Google's operating system, the result is not flattering. Besides the bloatware and carrier changes (you'll find plenty of both here), TouchWiz itself is still a poor substitute for a solid, stock Android experience (or even a more advanced skin, such as HTC's Sense). On the Fascinate, as with the other devices in this series, it comes off as a pale and often buggy imitation of iOS -- not something a lot of Android users likely embrace. There are some solid ideas here, such as the tweaks Samsung has made to the dialer (being able to tap out someone's digits and have it automatically find your contact is very welcome), but overall the skin felt extremely... unsure of itself. More than once the phone locked up doing what we considered to be basic tasks, such as switching between apps or back to the homescreen. The Fascinate just seemed to stall out, often at the most inconvenient times, and we were left to simply wait until it sorted out whatever memory or processor issues it seemed to be having. Comparatively, a device like the Incredible rarely if ever stalled out on us, even during heavy use. The Fascinate (as well as the other Galaxy S phones) just don't feel like they've been left in the oven long enough -- there are good ideas, but they needed to get to golden brown. This dough is still uncooked from what we can tell. We also noticed a weird delay when using the hard buttons along the bottom of the phone. Between pressing, feeling the haptic feedback, and actually seeing a result there was an almost (emphasis on almost) imperceptible pause for each action. Hitting the home button on the Captivate yields nearly instant results for us, but on the Fascinate there's a slight hesitation that makes the phone feel more sluggish than it actually is. We're not sure why there would be a difference between these two identical phones, but it's another frustrating detractor for Verizon's offering. And another thing about those buttons -- their lights dim before the screen (and often when you're navigating the phone), making getting around the device unnecessarily challenging. Here's a thought Samsung: just keep those illuminated until the screen goes to sleep. Otherwise, you may be bummed to know that the company doesn't seem to have worked out all those typos we found in the other versions of these phones. We still saw a handful of English errors that have no place on a top-tier device like this. As with the rest of the Galaxy S family, you get two keyboard options here -- Swype and the stock 2.1 keyboard. Neither of those really cut the mustard for us, and we found ourselves re-downloading Better Keyboard for the umpteenth time on an Android phone. At the end of the day, it's not all bad. In fact, Samsung has made some thoughtful choices and attempted to pull together what can seem like a disparate collection of odds and ends at times. Still, there are some problem areas here that never should have made it out of bug testing, and if this is supposed to be a high-end experience for an end user, we hate to think of what the other end of the spectrum would look like. The issues are even more pronounced having used stock Froyo (and even 2.1) on a Nexus One -- the experiences couldn't be more night and day (that's to say, the Nexus blazes). A smartphone should help you along, not hinder you, and all too often while using the Fascinate, we felt like we were hitting red lights. When it comes to Android on Verizon, there are some seriously excellent choices, and what it has to come down to is: is the Fascinate at the top of that heap? From where we stand, the answer is an obvious "no." It's not that the device isn't a solid phone or a reasonably capable Android representative -- it's just that Samsung and Verizon have made far too many compromises on this device to class it with something like the Droid Incredible or the Droid X (though we have complaints about the latter device's software as well). Unfortunately, the Fascinate (and perhaps the entire line of Galaxy S phones) are a byproduct of Google's ongoing fragmentation issues and seeming lack of focus for the Android platform. As partners scramble over each other to differentiate their products through often meaningless software tweaks, the end user suffers by being served with rushed, incomplete devices made more complex and less stable by companies that should be concentrating on making great hardware instead of "fixing" Android. We want to like what third-parties -- and Samsung -- are doing with the OS, but as in the case of the Galaxy S phones, the alterations feel more like barriers than passage ways.